To say I love this record would be an understatement but I’ll say it: I love this record! I Love This Record!! I LOVE THIS RECORD!!! 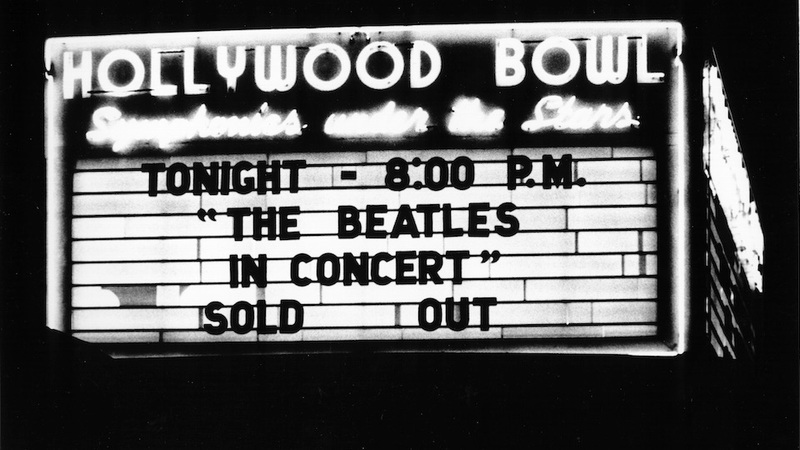 I was 12-years-old when The Beatles at the Hollywood Bowl was released in 1977. I found it accidentally on a Saturday afternoon while wandering around on Junction Boulevard in Corona, Queens, specifically at some weird little record store specializing in Latin music. It was only six bucks, which wasn’t as cheap then as it sounds now, but it totally shook my world. As investments go, it was a brilliant one. That excitement continues right up to the end of Side A (“Roll Over Beethoven”) and after the final notes of Side B (“Long Tall Sally”). Even just thinking about it, I can feel my heartbeat and my breathing change. The whole record is really a non-stop adrenaline rush. Right before that last number, Paul informs everyone that this next song is going to have to be the last number and the kids can’t take it. They are pushed even further over the top as they scream even louder because clearly, clearly, they never want it to end, the same way as I never wanted it to end as I lay there on my grandmother’s couch listening to it hundreds and hundreds of times (which was pretty easy to do seeing as the whole record is only 29 minutes long). Though separated by over a decade from the actual concert on vinyl (which were recorded in 1964 and 1965), I was one of those 17,000 kids, and for one brief half-hour, it didn’t matter if the world were flat or round because it was perfect and safe and fun. It was the way life was supposed to be. The Beatles were precisely what Timothy Leary had proclaimed them to be: mutants or prototypes of evolutionary agents sent by God and endowed with a mysterious power to create a new human species — a young race of laughing freemen. After hearing The Beatles at the Hollywood Bowl, I wanted to be part of that evolution, that revolution. They were my instant heroes from that point forward. It was because of this record, which went to Number One in several countries and sold at platinum-levels in the U.S., that I had to hear Sgt. Pepper’s Lonely Hearts Club Band and The White Album and Let it Be. It was why I had to see movies like Yellow Submarine and Help! and A Hard Day’s Night, and that I had to read everything ever written about John and Paul and George and Ringo, and why to this day I still can’t walk past The Dakota or through Strawberry Fields in Central Park and not feel the pain of John Lennon’s death. The Beatles at the Hollywood Bowl was my introduction to a guy who seemed so cool and so funny — like the greatest pal you could ever imagine. A compilation of three concerts (one in August 1964; two in August 1965), this album features a nice mix of hits (“She Loves You,” “All My Loving,” and “Can’t Buy Me Love” among them) — all meticulously produced and engineered by George Martin and Geoff Emerick into one incredibly perfect performance which now serves as a triumphant document of a time in history forever known as “Beatlemania.” For some of us, that’s an era as important as the Industrial Revolution or the Ming Dynasty. One of my favorite Beatles clip is from one of the Ed Sullivan appearances, where they perform ,This Boy. John’s vocals send chills up and down my spine. Love your story! And HEY!! We have the same last name! Crazy! Dear Larry- A music DJ extraordinaire sent me your article. With even a first glance, “I get that”. Nice write up on your own take on how you discovered The Beatles; though so many years later…we can see they grabbed hold and didn’t let go. -> I was at the Hollywood Bowl concerts in L.A. in ’64-65. Yes, it sent chills up my spine. No, I wasn’t a screamer (mostly tiny pre-teens we have to thank for that). I was a crier/sobber. I was 17. My god. Still, it’s a defining moment in my 70 years; though I’ve stayed around the music industry; was a teen DJ, have many friends in the rock music business. And still a huge Beatles fan. When you’re turning 16 and see The Beatles for the first time on TV when they descend the Pan Am stairway arriving in New York, you don’t plan on it…but one of those 4 guys appeals to you. You don’t even know their names yet, entirely…or who plays what, February, 1964. You’ve fallen in love with their sound through the radio, before you see them perform on TV…..and so when they appear days later on Ed Sullivan; you have nowhere to go but deep into the shirl of a lifetime; The Beatles. Amen. Larry, I LOVE THIS ARTICLE!! It brought me back to 7th grade when my neighborhood crush, Eddie, invited me to his house to listen to this album. I can’t remember if I liked him because he owned the record, or if him having the record made me like him more: but regardless, I’ll never forget listening to those heartbeat-stirring tracks over and over again, the voices and instruments which rang like a cathedral choir and organ through that tiny, mono record player. Thanks for resurrecting these fond memories, and yes: it’s a GREAT frickin’ album. Well done, buddy!